Shoe Spreader 3rd Millenium - $0.00 : Hawkesbury Toolworx - Tools, Farrier Supplies & Outdoors - Specials- For an extensive range of tools for all types of tradesmen and all your farrier, hunting and ammunition or outdoor supplies. The design of this tool is simply a levering device with a differential length of arms on the head. 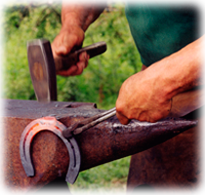 Ideal for racehorse farriers who are cold shoeing and/or farriers doing a lot of refits. The short and long arms allow you to apply differential force to the inside web of the shoe thereby opening it exactly where you want.